The Emerald Isle holds a sort of mystical lure amidst the backdrop of its luscious green landscape. Situated in the Atlantic Ocean, this small European island packs a big punch. 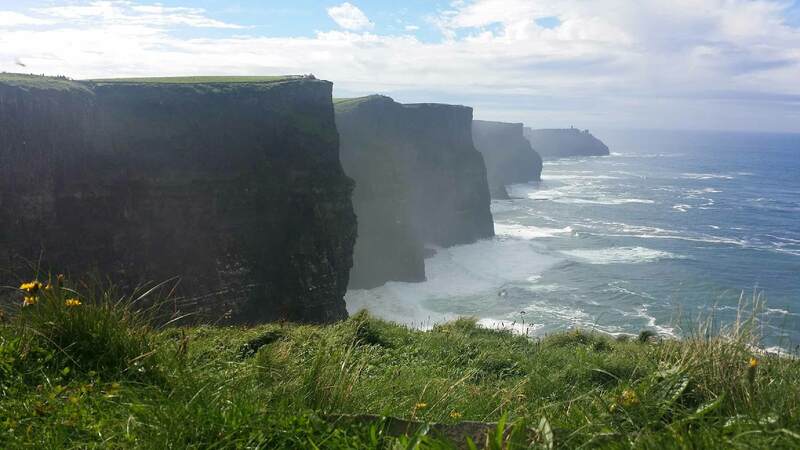 “I’m going to Ireland,” means something different to each traveler. Perhaps it’s your first international trip on a brand new passport. Maybe you’re headed north to see the land from which your ancestors came and learn more about that Irish heritage of yours. Or, you might be camping or hiking your way across this great country to commune with the land and learn more about yourself. Ireland is an amazing place to adventure with friends, explore a bit, eat a bit, drink in pubs, chat with locals, and wander through the footsteps of history. Regardless of the reasons you’re headed to Ireland, your voyage begins before you set foot across the border. Dream up your kind of journey, research adventures for your trip, and figure out what to pack. They don’t call it the Emerald Isle for nothing. Ireland is a beautiful blend of urban adventures, small town charm, and countryside that begs to be wandered. Ireland is full of small towns and hamlets, each with its own flair. If you want to get to know a town, visit the pub on a Saturday afternoon or after work on a week day and get to know the locals. No doubt you’ll explore many, but don’t miss Cork, famous for the Blarney Stone, but full of other interest too. The English Market is wonderful. Traveling through Ireland is like adventuring through a postcard. The scenery is spectacular at every turn. History blends with culture and preserved wildlife in national parks and secluded islands. Be sure to take the time to explore some of the best of the Irish countryside. Rent a car. Take a bus trip. Or maybe just a long walk. No matter where you’re traveling (Ireland definitely included), there are a few things that should always be packed. If you’re smart, you will keep these in the bag that never leaves your side, because these are the items that are most important and often hardest to replace. If you’re flying to Ireland, and you probably are, you’ll want to think carefully about packing your personal item so that you’ve got all of the necessities at hand for the flight and immediately when you arrive. If you choose to check a bag on your flight, be even more intentional about packing this personal item, in case the airline loses your luggage and you have to live out of this bag for a day or two! Keep in mind the TSA 3-1-1 rule as you pack your toiletries. Remember that less is often more and you can purchase everything you need in Ireland. Consider trying dry toiletries to make more room in your quart sized ziplock bag. Ireland can be a packing challenge. On any day of winter, spring, summer or fall – you may need layers, sunscreen, a raincoat, a hat and closed-toed shoes. As a rule of thumb, always remember that the possibility of rain is real every single day. The old saying is true, “There’s no such thing as bad weather, only bad clothing.” Weather can be unpredictable and it’s a good idea to pack for three seasons, no matter when you are going. That means something warm, solid shoes, and a rainproof outer layer, at least. If you’re coming from outside of Europe you are likely to need an adapter for your plugs and maybe a power convertor too. Be sure you’ve got your cords and extras of the things you need to connect. Plan for your phone connectivity, unless you already have T-mobile. Ireland has a casual vibe most places. Unless you’re planning for a very special occasion, there’s no need to pack your fancy clothes. Remember that layers are your friends. Of course there are a few comfort items and extras that will make your trip more pleasant. Everyone has a slightly different list, but these items might be things to consider as you head to Ireland. Ireland draws countless visitors season after season and year after year. Enticing guests from all parts of the globe, people come for the scenery and stay for the flowing libations. Whether it’s the green of the countryside, the brown goodness in the glass, or the kindness in the hearts of the countrymen – Ireland doesn’t disappoint. Pack for all seasons, keep your extremities warm and dry and plan to split your time between urban adventures, small town pubs, and the gorgeous countryside.